First, download the source code for the latest stable release from the Wireshark download page. We will use release 2.6.2 in this example. In this paper we studied the usage of H.264/AVC video compression tools by the flagship smartphones. The results show that only a subset of tools is used, meaning that there is still a potential to achieve higher compression efficiency within H.264/AVC standard, but the most advanced smartphones are already reaching compression efficiency limit of H.264/AVC. Published in: Sharabayko M.P., N.G. Markov. H.264/AVC Video Compression on Smartphones. Journal of Physics: Conference Series. Vol. 803, 2017: Information Technologies in Business and Industry (ITBI2016). 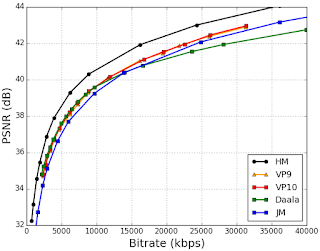 In this paper we compare compression efficiency of the latest video coding standards H.265/HEVC, VP9, VP10 and Daala to H.264/AVC with the help of reference video encoders available. Sharabayko M.P., Markov N.G. Contemporary Video Compression Standards. H.265/HEVC, VP9, VP10, Daala. Control and Communications (SIBCON), 2016 International Siberian Conference on, Moscow, 12-14 May, 2016, pp. 1-4.
that can be found on IEEE Xplore. This Python scripts implements fast matrix-based conversion from YUV to RGB colospace. Conversion from YV12 (YUV420) requires one extra line of code to perform up-sampling of chroma planes. A script evaluating PSNR metric of two YUV420 frames. In this post I share my test results on x265 coding efficiency to track the development progress. The x265 version 1.4 was used for this test, as well as the JCT-VC test sequences. It is worth mentioning that the Class E sequence set has changed, as described in JCTVC-O0022. However, for backward compatibility of the test results I still use the old test sequences set.